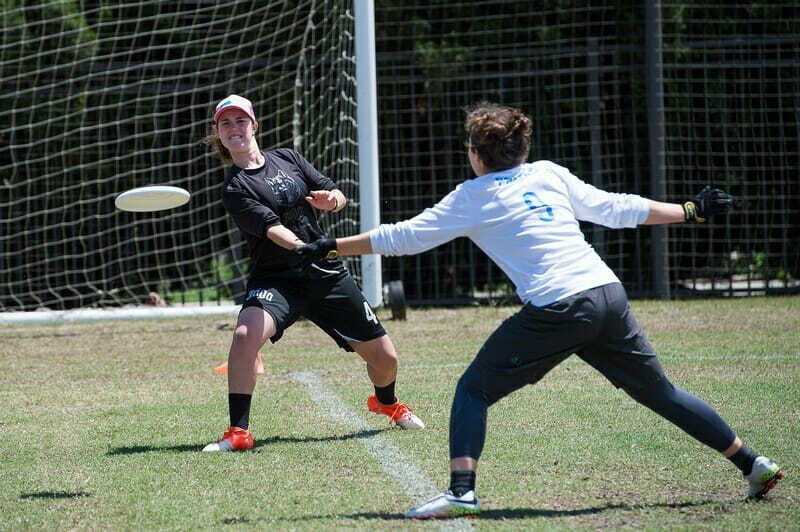 Coverage of the women’s division at Easterns is presented by VC Ultimate as part of their season-long support of our women’s coverage. All opinions are those of the authors. Please support the brands that make Ultiworld possible and shop at VC Ultimate! MYRTLE BEACH, SC—#18 NC State Jaga Monsta blitzed through the women’s field at Easterns. They took the title while posting a combined score of 104-37 over seven games. NC State’s level of competition wasn’t spectacular, but they did have the added pressure of needing to blow everyone out in order to secure a strength bid for the Atlantic Coast. They did that and then some with their performance over the weekend. The biggest scare of the weekend for NC State came in the final. They played UNC Wilmington for the second time in the tournament, having played them in crossover play on Saturday. While NC State beat Georgia in semis by a healthy 15-6 count to get to the final, Wilmington ran away from Duke in their matchup to set up the rematch. Wilmington had given Jaga their tightest game of the weekend to that point in crossover play, but that was still a 15-7 drubbing. It didn’t seem like NC State would have any trouble winning the Easterns crown. But the final started disastrously for the tournament favorites. They came out making poor decisions and execution errors and lacked the defensive intensity they’d had all weekend long. In a flash, Wilmington took a 5-0 lead. NC State finally got on the board for 5-1, but Wilmington answered with a hold to make it 6-1. Jaga had put together big enough runs earlier in the tournament to overcome the deficit, but they hadn’t faced a real challenge like that all weekend. But Jaga didn’t crumble. Instead, they went on a 14-0 run, blanking Wilmington the rest of the way to win the game 15-6. After NC State got their first couple of breaks, the snowball started rolling against Wilmington. Where Seaweed completed some spectacular throws and catches in their opening salvo, it seemed like every play was difficult for them as NC State mounted their counter attack. Jaga did ramp up their defensive pressure to where it had been earlier in the tournament. But missed resets and drops from Wilmington gave NC State the opportunities to turn a handful of breaks into a decimating run to win the game. Jaga were also the beneficiaries of an astounding performance from senior handler Ashley Powell in the final. She was stellar in the first half, the driving force to her team’s comeback. But in the second half she was absolutely lights out, as her team ruthlessly put the game away. Powell assisted on all five of NC State’s first five goals of the second half. She didn’t assist on their sixth because she took the point off. On the seventh and final point, she recorded a secondary “hockey” assist. She was on fire. Backhands, forehands, huge hucks, crafty high releases: Powell made it all look easy in the second half. “You know it’s the finals, so I figured I might as well just take over, do what I can,” said Powell of her blazing performance in the final. Comments on "NC State Uncontested at Women’s Easterns"